The Germans go crazy for asparagus (spargel) this time of year. There, as here, asparagus is a sure sign of spring, or, as the Germans say, asparagus is the “Joy of Spring.” In late May, the Black Forest Inn will devote a menu to asparagus! They serve fresh, local asparagus in as many delicious ways as they can think of. If you aren’t an asparagus lover already, you will be after Spargelfest! 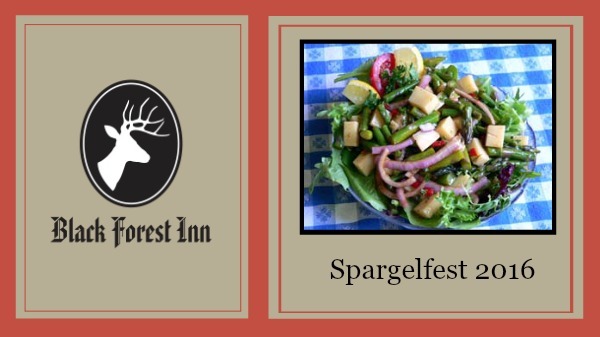 Visit Black Forest Inn from May 20th through May 29th during Spargelfest! Black Forest Inn is pleased to serve the freshest possible asparagus. Their green asparagus is brought to them fresh off the farms by the Southeast Minnesota Food Network, a collaborative effort to change the way southeast Minnesota purchases and consumes food. The participating farms operate under guiding principles of sustainability, land stewardship and fair prices. For more info Southeast Minnesota Food Network.